Winner of 4 Club Awards, Sian is the twin sister of Tania, who also won 4 club awards. 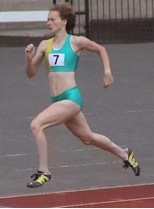 Sian got involved with athletics when she was at primary school, joining the club aged 12. She was proud of representing the county on the track and her school at cross country. Sian was a key team member of the Ladies Midland League Team that won three successive promotions as division champions from 1990-1993.